De Grasse — French premium Tier VI cruiser. According to the draft design in 1938, the light cruiser De Grasse was developed from the La Galissonnière-class ships, and shared their main advantages: improved armor and good main battery guns. She had distinctive AA armament, increased speed, and slightly reinforced torpedo tubes. De Grasse was first released for sale on 9 June 2017 for the EU server and 19 June 2017 for the NA server. De Grasse is a Tier VI premium French cruiser that is a development of the La Galissonnière class. Both ships feature triple 152mm turrets in an AB-X configuration firing identical shells, though De Grasse has a higher rate of fire and slightly longer range. Given how quickly she puts shells downrange and the fire chance on her high explosive rounds, De Grasse is a superb fire-starter and a threat to burn down enemy capital ships at ranges that make her difficult to hit. Torpedo-wise, De Grasse features triple launchers instead of the twin launchers found on La Galissonnière, and each mount has a longer reload time as a result. De Grasse’s torpedoes are excellent long range harassment and area denial weapons, good for throwing around islands and into caps hoping to hit unsuspecting enemies; however, with only 3 fish on each side, captains shouldn't rely on them to devastate enemy battleships at close range. Both ships have unimpressive secondaries and weak AA. While De Grasse’s anti-aircraft armament is sufficient for self-defense, her long range AA power is badly lacking even with Defensive AA Fire ( ) active; she's not a ship that her teammates can rely on for anti-aircraft support. De Grasse is notably faster than La Galissonnière, but has a longer rudder shift time and a wider turning circle. She retains La Galissonnière’s access to the Engine Boost ( ) consumable, while adding access to a Catapult Fighter ( ) that La Galissonnière doesn't have. Captains who are veterans of La Galissonnière will feel right at home playing De Grasse, and will find the slight improvements to her rate of fire and torpedoes to be welcome upgrades. Faster reload time than other French cruisers with 152mm guns. Main battery turrets traverse quickly, taking only 15 seconds for a full turn. Torpedoes have a range of 9.0 km with 60 knot speed. High top speed which can be increased further with the Engine Boost ( ) consumable. While her reload time is faster than both Émile Bertin’s and La Galissonnière’s, it is still slow compared to other cruisers carrying 152mm guns. Only three torpedoes per side. The ship’s rudder can be incapacitated very easily. Anti-aircraft suite is woefully inadequate. As a premium ship, De Grasse doesn't have any upgrades to research. Slot 1: Main Armaments Modification 1 ( ) as De Grasse's anti-air capabilities are not very good and she relies mainly on her main batteries to deal damage. Slot 2: Steering Gears Modification 1 ( ) as she is a French light cruiser with a very weak rudder (easily incapacitated). Slot 3: Aiming Systems Modification 1 ( ) because her anti-air capabilities are not very good and the decrease in dispersion will help a little bit more. Slot 4: Steering Gears Modification 2 ( ) to help with the already poor rudder shift time on the cruiser; she has the worst rudder shift out of all the Tier VI cruisers (with Budyonny second-worst). She basically has the same consumables as Algérie and Charles Martel, but with the Catapult Fighter and Engine Boost consumables in switched positions. It is highly recommended to mount premium Engine Boost II ( ) to maximize the usage of the ship's speed, and to mount premium Damage Control Party II ( ) if the player finds the rudder is incapacitated frequently. Premium Defensive AA Fire II ( ) and Hydroacoustic Search II ( ) are optional, and the choice between the two is up to the player. Premium Catapult Fighter II ( ) is not recommended. As a premium ship, De Grasse comes included with Type 10 camouflage that lowers her detection radius, reduces the accuracy of incoming shells, and increases the amount of experience she earns. Like other French cruisers, De Grasse benefits significantly from signal flags that increase HE fire chance. Juliet Charlie ( ) may be used to mitigate the increased risk of detonation gained when mounting India X-Ray ( ) flags. November Foxtrot ( ) reduces the cool-down timer for consumables which is especially useful for the engine boost consumable. Sierra Mike ( ) is also highly recommended to increase the ship’s top speed. Special and Economic signal flags can be mounted to increase the experience and credit gain per battle. De Grasse comes with her originally planned 152mm main battery. De Grasse is stalked by torpedo bombers from an enemy Ranger. Ranger’s dive bombers land hits on De Grasse while she maneuvers to evade a torpedo attack. Flag of De Grasse. Given to players who purchased a special bundle containing De Grasse. De Grasse at anchor, location unknown, circa 1961. By 1936, the Marine Nationale was looking for the next generation of cruisers to succeed the then-modern La Galissonnière-class of ships. Still adhering to the limitations imposed by the 1936 London Naval Treaty, France sought to construct a new type of light-cruiser under the 8,000 ton benchmark. Rationally, as successors to the 7,500 ton La Galissonnière-class cruisers, the new light cruiser De Grasse would use the extra displacement to improve on the deficiencies discovered on the preceding light cruisers: specifically, the aviation facilities, the armament suite, and propulsion. Originally designed in 1936, the cruiser was planned to have no less than two aircraft catapults, and the facilities to carry up to three individual aircraft. Furthermore, a series of lifts and tracks between the hangar and catapults were implemented to automate the process of launching aircraft. By positioning the dual-hangar amidships, De Grasse would use a single-funnel design, as opposed to her predecessor. The space on top of the hangars was used to install light AA and secondary fire directors. However, it was discovered that the aviation facilities were very cramped and she would be top heavy in this configuration. Therefore, by the 1938 design proposal, she was limited to a single hangar, which meant a rearrangement of light AA and fire control. De Grasse’s main armament was of particular concern (due to the underperformance of her predecessors). After a few design proposals, it was decided to use the same rifles and configuration as La Galissonnière-class, but the turrets themselves would be modified triple-gun versions of the dual-purpose guns mounted on battleship Richelieu. Although they were heavier, these new mounts would have the ability to engage both surface and air threats, as they could elevate the guns up to +70˚. Additionally, these new mounts had the ability to reload at any elevation, offering a significant increase in rate of fire. Since the hoists for the shells and power were displaced off to the side of the guns, the turret could fit the smaller dimensions of a cruiser. Similarly, there was a revision of the AA suite of the De Grasse class. They would mount the completely novel twin 100mm Mle 1933 DP guns in fully-enclosed pseudo turrets – type avisos-dragueurs. Not only were they better protected, but they could also be directed via centralized fire control. Unfortunately, due to weight and necessary space for dedicated magazines, only a few could be fitted. The three guns were all placed aft, which gave excellent rear cover but poor front cover. To compensate for this weakness in her AA arrangement, four (4) twin 37mm Mle 1933 AA guns were positioned forward. Another improvement from the La Galissonnière class, De Grasse mounted 2 triple 550mm torpedo tubes, one on each side, amidships. To ensure there was not any loss of performance due to the increase in displacement, an improvement in main propulsion was required. While the internal layout was similar to her predecessors, new machinery was installed in place of the old. Boilers that were akin to the models used in contre-torpilleurs – which would operate at higher-pressure loads – and turbines that could be configured for multi-pressure work were installed. Ultimately, her designers were able to increase De Grasse’s power from 100,000 to 110,000 shaft horsepower, resulting in a top speed above 32 knots. In the end, De Grasse was a cruiser that shared design characteristics of the La Galissonnière class and cruiser Algérie. Her hull was superficially similar to her predecessors, albeit with a more flared and narrow bow to increase sea keeping. Her superstructure was akin to the heavy cruiser: built around a central tower and a single funnel amidships. De Grasse used a combination of high tensile steel and duralumin – on the hull and superstructure, respectively – to decrease displacement and top weight. To save design time, a similar armor profile as the La Galissonnière class was used on De Grasse as well. With her design finalized, De Grasse was laid down on 28 August 1939 at the Lorient Naval Dockyards. The commencement of the Second World War in September 1939 halted her construction, and she was not launched until 11 September 1946. In 1951, she was towed to Brest Naval Yard and was finally completed as an anti-aircraft cruiser with a radically different main battery configuration. She was commissioned into the Marine Nationale on 10 September 1956. Despite being laid down nearly two decades earlier, De Grasse finally entered service in 1956, becoming the flagship of the French Mediterranean Squadron. Her service in the Mediterranean was largely uneventful, serving there from 1956 until she was taken out of service momentarily in 1964. Following two years of conversions, she re-entered the Marine Nationale as the flagship of the Nuclear Testing fleet, bound for the French Polynesia. There she would remain until she was decommissioned in 1973, and sold for scrap in 1974. De Grasse is represented in World of Warships in the configuration she would have had if she had been completed using her original design. Her as-built armament in 1956 was reminiscent of the Atlanta-class light cruisers of the U.S. Navy, comprised of eight (8) twin 127mm dual-purpose turrets. 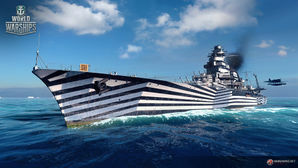 The dazzle camouflage scheme is actually the historical camouflage of Gloire, a La Galissonnière-class cruiser. De Grasse was never camouflaged. A bow view of De Grasse. De Grasse, date and location unknown. Colbert, sister ship to De Grasse. She retains her armament as completed. This page was last modified on 23 August 2018, at 12:57. This page has been accessed 63,921 times.